Beard’s Plaisance	The scenic picnic grounds have become a popular gathering place in one of the city’s oldest parks. 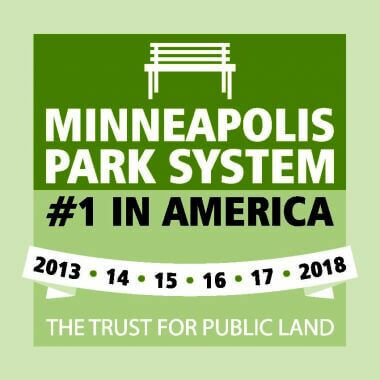 Size: The park is included in the 126.2 acres of land the park board owns around Lake Harriet. Henry Beard was one of three men—the others were James Merritt and Charles Reeve—who approached the park board with an offer to donate land around Lake Harriet for a park in 1884. After a complicated legal battle, some of the land around Lake Harriet that Beard and the others had donated was declared to be the legal property of William King, whose farm had once encircled the lake. After he had reacquired rights to the land, King, who had been one of the staunchest advocates for parks in Minneapolis, stood by the commitment of Beard and the others to donate the land. Beard was never implicated in the misappropriation of land from King. In 1888 the park board reported that it had paid Beard about $8,000, including interest, for land acquired from him at Lake Harriet. It is unclear if that payment applied to Beard Plaisance or Linden Hills Boulevard, which was also acquired from Beard, or both. The park board first approved improvements to the “Beard land” in 1889. 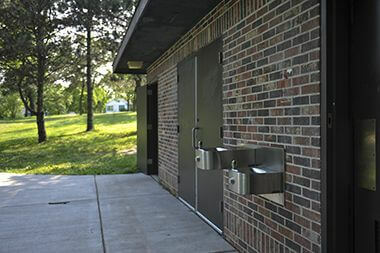 The first picnic shelter at Beard Plaisance was built in 1904 and a stone walk was constructed along Upton Avenue west of the park. In 1907, superintendent of parks Theodore Wirth proposed building a peninsula into Lake Harriet at Beard Plaisance to improve the “regular and monotonous” shoreline of the lake. It was an ambitious plan that was never acted upon. In 1912 Wirth recommended a plan to rebuild and rearrange the eight-year-old picnic shelter. In the meantime, a tennis court was apparently built at Beard Plaisance. Tennis courts were built and removed at many parks without reference in park board proceedings, especially in the early 1900s. 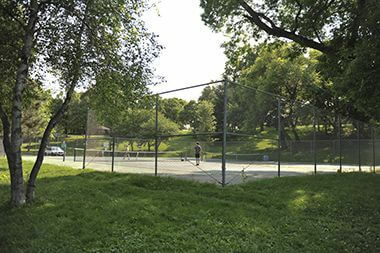 Park board proceedings reveal that “additional” tennis courts were requested for Beard Plaisance in 1912 and again in 1915, at which time the board recommended more courts be added there as it was the only place around the lake where they could be added without considerable grading expense. Finally in 1916, the board ordered the construction of two new courts to complement the one already there. As with most tennis courts built at the time they were probably built without backstops and nets. Toilets were also built at Beard Plaisance in that era. Although it is unclear when they were first built, the board considered a request in 1915 to remove them from the vicinity of the picnic shelter or build them into the hill beneath the shelter. Instead the park board voted to plant shrubbery around the toilets to make them less conspicuous. New toilets were approved for the park in 1921. 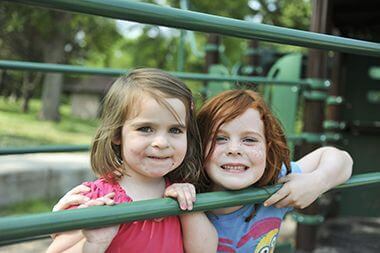 A year later the park board responded favorably to a request by the Robert Fulton Community Club to provide a supervised playground for small children in the park. The only recorded improvement to the park over the next few decades was the renovation of the shelter in the late 1930s by federal work relief crews. Several improvements were made to the park in the 1970s. In 1974 new playground equipment for little children was installed and in 1979 the tennis courts were renovated and a parking lot was added next to the courts. At the same time the picnic shelter was re-roofed. The picnic shelter was refurbished in 2002. Reconstruction of the playground, with the complete replacement of playground apparatus, began in 2011 and completed in 2012. 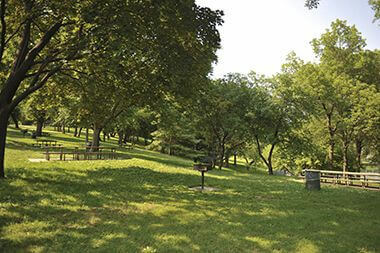 Reserve the picnic area at Beard's Plaisance. Seating for 80 with electricity available. Five grills, restrooms nearby. 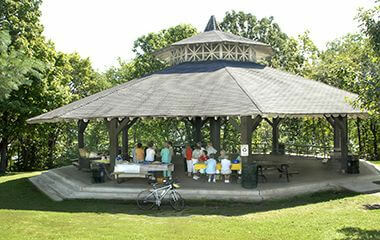 The picnic shelter [PDF] at 45th and Upton Avenue South offers a view of the west side of Lake Harriet. 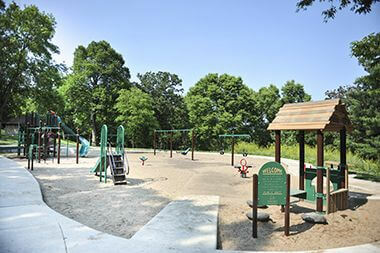 In 2012, the playground at Beard's Plaisance was reconstructed.